Estonian folk metal warriors Metsatöll kicked off the evening with perhaps the most classically inspired set of the night. Their powerful, sombre renditions of traditional folk music and 13th and 14th century history give them a dignity and presence that sets them apart from their peers, but in a live setting, songs that come across almost grave in their weightiness on record were imbued with new life, and the band members clearly fed on the energy of the crowd (sizeable despite the early evening set time). Lauri "Varulven" 'unapuu's spine-tingling baritone and brash handling of traditional folk instruments (including piping a totupill from behind his head) was a definite highlight. After a few technical glitches, Týr put on a thunderous set. The band drew primarily from their latest album, The Lay of Thrym, including the title track, the blood-stirring "Hall of Freedom" and the moody ballad "Evening Star." They also treated the crowd to old favourites, such as "Sinklars Visa" and the beloved "Hold the Heathen Hammer High." The Opera House was packed to their gills for set, and hearing hundreds of fans screaming along to "By the Sword in My Hand" is always a joyous experience. Moonsorrow's set was the highlight of the night. Frontman and bassist Ville Sorvali was gracious but bantered with the crowd very little, preferring to focus on the music. Moonsorrow always challenge themselves live, and this performance was no exception, performing long, twining, sinuous songs that definitely hail from the more intellectual and emotive side of the heathen metal spectrum. The spell they cast over an audience was incredible, and even during a 12-minute epic, the audience remained riveted. The final song in their set, a muscular yet emotionally vulnerable rendition of "Kuolleiden Maa," was deeply moving. 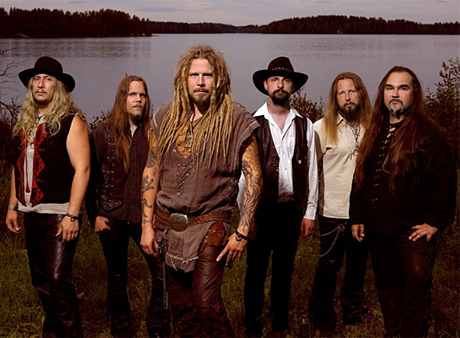 You have to give it to Korpiklaani: the Finnish folk metal barons sure know how to throw a party. From the moment their set began, the entire floor of the opera house became a heaving pit, which was actually more akin to a heavy metal dance party, as kids wearing utilikilts and with warpaint smeared across their faces jumped around and did gleeful jigs that spilled up the stairs. This was not the most coherent set Korpiklaani have played; vocalist Jonne Järvelä seemed to frequently forget the lyrics and either repeat himself or mumble through, though due to the fact he was singing in Finnish and everyone was far too busy dancing, very few in the audience seemed to notice. The run of songs they played at the end of the set -- "Vodka," "Happy Little Boozer" "Tequila" and "Beer Beer" -- neatly encapsulated what Korpiklaani have become: a sloppy celebration of drink and good cheer.